In creating the education system for the ingREeS project, we have been innovating the educational process so that it uses the modern forms of education that are currently used in various educational institutions. Education took place in a combined (hybrid) form of teaching. In addition to classical physical attendance, training took place in the form of electronic courses. E-learning is becoming more effective, helps to understand the issues easier, and the learner could choose their individual optimal time to study. A major role in this form of education is played by its own initiative and the effort to consolidate acquired knowledge. On the other hand, the system is also advantageous for trainers who are not time-limited and can provide the most up-to-date information in their field. The priority role of the ingREeS project was to enable the education program to produce people capable of actively applying the acquired knowledge and skills corresponding to the European standards and requirements of today’s Europe. in the form of video-projection. Physical training was interconnected in the regions via videoconference to bring the topic to the widest spectrum of listeners. Video- projection allowed you to be connected directly from the comfort of your home, office or to watch directly from the regional office’s training room. Participants could thus continuously monitor all the 10-lecturers who gave lectures in 16 modules, as well as other practitioners. Education in the form of training and courses was realized in Slovakia in the towns such as Bratislava, Trnava, Banská Bystrica, Žilina and Košice. Each of the five educational programs for Middle and Senior Level Professionals on Energy Efficiency and Use of Renewable Energy Sources in Buildings, had its professional guarantor on both Czech and Slovak side. Experts in each country were the foremost specialists in the field. The portal provides access to comprehensive study materials for self-education and access to test exercises. Every participant interested in a certain topic within self-education can select a specific area of education through the modules. Upgrading the Modular Study is a program study. Self-education materials consists of presentations from training sessions, animations, videos, text, and, last but not least, tests for verifying the participant’s training. 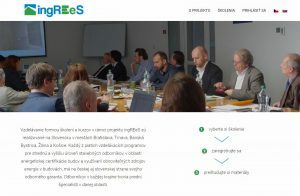 The ingREeS project brought qualitative change to the system of lifelong learning, in the construction sector, to increase efficiency and participation in educational activities. This project involved professional organizations and associations bringing together target groups with the vision of building a system of further education for construction professionals at secondary and higher management level, whose graduates gained the skills and knowledge to meet European standards, expectations and requirements of today’s Europe. Participants in the ingREeS training and training programs are better prepared for the changes brought about by the creation of future projects as well as the realization of buildings and should become more qualified experts in the field of and use of renewable energy sources in buildings. The webpage was dedicated to an electronic system of exercises and tests. The goal of the portal was to develop exercises and tests. The exercises serve to gain and consolidate knowledge, which can then be required during the test. Tests are a one-way way of verifying acquired knowledge, skills and habits. The portal is enabled to implement one of the essential elements of e-learning, namely consolidation of acquired knowledge through exercises, training tests, and the possibility to pass a final test that demonstrates the level of knowledge gained by each participant. We will be happy if you learn more about the opportunities offered by this portal in order to be able to pass the test with minimal distractions, that can be part of the written part of the exam. Secondly, experienced professionals (skilled researchers, teachers, managers and other industry experts) in the area covered by the project participated as experts contributing to the preparation of training and training materials and the future trainers of the training to be delivered within this project. The portal contains a database of all trainers, training participants, and study materials.